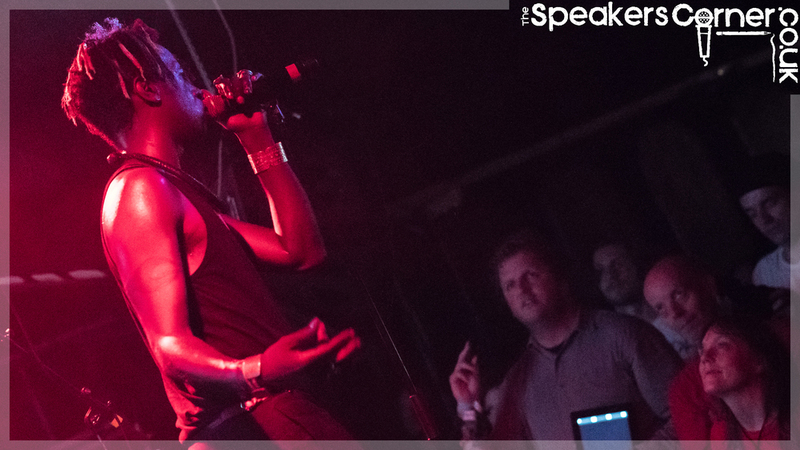 Rapper-poet legend Saul Williams’ presence in Bristol proved to be a cathartic, nigh-on-spiritual affair. Onboard Bristol’s Thekla as part of a UK tour, he was joined by fellow US artist Joe Driscoll and UK multi-instrumentalist-rapper Dizraeli - three massively talented artists, all rooted in hip-hop but with their own twists and takes on the genre. Joe Driscoll's rap-laden roots-rock provided bottled sunshine in its purest form to set the night off, utilising live recorded loops and superb beatboxing coupled with Frusciante-esque guitar licks. ‘Mixtape Champs’ – a paean to the creating of a mixtape for a new flame was neat and breezy: ‘Back in the days of a girlfriend mixtape/Perfect prose to hit with a sick break’. There was much in his chilled, evocative music and raps that recalled sunnier climes and good times. Second support act was Bristol-born, London-based Dizraeli. His forthright, passionate spoken-word and hip-hop, with catchy musical refrains went down well with the audience, all too aware that in the outside world a referendum deciding the future fate of the UK just happened. Socially aware, Dizraeli made reference in his performance and musings to this political climate. Fittingly, his songs like ‘Engurland’ touch on such issues. Massively engaging, he got the crowd clapping and singing along with gusto. Mid-set he produced what appeared to be a thumb-piano type instrument, adding an eclectic twang to his performance. His pieces also confronted issues of prejudice and identity with a mixture of indignation and dark humour, remarkably candid and soul-bearing throughout. Saul Williams arrived on stage with a bizarre and absolute majesty, approaching the mic initially with a funerary amble. Sporting a crow mask – reminiscent of those of 17th century plague doctors – he was flanked by hacktivism-illuminati visuals, which name-checked and portrayed as countercultural symbols the Kutis, Teslas and Nietzsches of this world. Thus his live show, as on his records, welded arty, literate rap to politics. Dramatically building tension with ‘Down for Some Ignorance’, he then launched straight into a fast-paced set, at times getting straight into the pit, face-to-face with the audience – even collapsing on the floor of the pit to deliver his lines lying-down, enclosed by euphorically astounded fans. In this sense, Williams has all the energy and grit of a one-man punk act. As those who are familiar with his output to date would expect he does not flinch in the face of dark, deathly issues: the re-fashioned At The Drive-In refrain of "dancing on the corpses’ ashes" of ‘Ashes’ and its consideration of political violence. Laden with chaotic energy, the set encompassed the rock-tinged industrial hip-hop of his material of a decade ago and the electroclash of more recent records. He gave a taste of new material, like ‘Burundi’, adopting a global perspective: "Factories in China, coltan from the Congo/Smuggled to Burundi, hidden in a bongo"– asserting that anywhere is Burundi, the interconnectedness of systems of exploitations in today’s globe. Sonically the set was immense, with searing synths and industrial beats bolstering Williams’ words. At times, like a rave, at others almost sermon-like, it was enough to ignite even the sometimes poseur Thekla crowd, with many punters breaking forward to see what the commotion was all about. Diehard Williams fans were clearly ecstatic, particularly at those instances of his lurching off-stage to perform amongst the room. As much as he's a towering figure in alternative hip-hop circles, a precursor to groups like Flatbush Zombies and Death Grips, Williams is aware of his musical lineage – going so far as to recognise music from Bristol as a heavy influence and seemingly savouring the opportunity to perform in the city. Slinking off-stage towards the end of the set, Williams returned to serve up a powerful encore that included the classic ‘Black Stacey’. Simultaneously unhinged and fully controlled, combative and soothing, he was at all times otherworldly. Full of tension and catharsis, Williams is an engaging, exhilarating act to see live: politically-conscious and art-driven while managing to create an off-the-hook, thundering show. Accompanied by the live improv of the Tongue Fu band, Kate Tempest crafts a unique and powerful performance in this video, wowing the audience with her trademark blend of visceral delivery and intelligent lyricism.